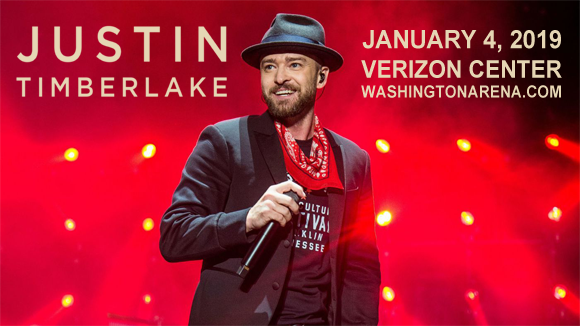 Pop icon Justin Timberlake comes to Verizon Center on Friday 4th January 2019 on his extended Man of the Woods Tour! One of the most talked-about shows of 2018, the Man of the Woods Tour shows the global superstar in a more intimate light, treating fans to cosy sing-alongs in combination with the huge, jaw-dropping numbers the “Rock Your Body” performer is renowned for! Tickets available now! American singer-songwriter, actor, dancer, and record producer Justin Timberlake has sold over 32 million albums and 56 million singles globally throughout his career, making him one of the world's best-selling music artists. Timberlake has has a career in entertainment since he was a child, growing up as part of the television shows Star Search and The All-New Mickey Mouse Club. In the late 1990s, Timberlake made his name as one of two lead vocalists of one of the best-selling boy bands of all time, NSYNC. As his time with NSYNC came to a close in 2002, Timberlake embarked upon a solo career, releasing his four-times-platinum and two-time Grammy Award-winning debut album Justified in November of that year. Four of Timberlake's five solo studio albums charted at number one in the US and, to date, he has won ten Grammy Awards, four Emmy Awards, three Brit Awards, and nine Billboard Music Awards.